A couple of weeks ago I posted that I would be teaching Lightroom CC and Photoshop CC classes for PVNET this summer. The details have been worked out now. There will be three classes all during July. Each class will meet for one week on Monday through Thursday evening from 6:30-8:30 pm for a total of 8 hours. The classes will be taught at PVNET’s summer home in the Palos Verdes Peninsula Center Promenade. It is on the second level right beneath the Regal Theater. We will be using the latest software, but if you have recent versions of either program, that will be fine. The number of PCs are limited, so sign up early! To the best of my knowledge this is the only adult school or similar educational facility that has Creative Cloud (CC) versions of these programs. To find out more about each class and to register, click on the class link below. Recent versions of Photoshop have a Targeted Adjustment Tool accessible from the Properties panel of the Curves and Hue/Saturation commands. In the Adjustment Layer Curves command panel, it is the hand in the top left of the panel that contains a two-sided arrow. Selecting the tool and then dragging it up over a portion of the image, lightens all of those pixels that have the same tonal value anywhere in the image. Dragging it down darkens pixels of similar tone values. The short video below demonstrates this tool. Watch how the shape of the curve changes. The Hue/Saturation command also has a Targeted Adjustment Tool. Dragging it over to the right over a portion of the image will increase the saturation of similar color pixels and dragging it to the left decreases the saturation. Control-dragging the tool changes the hue of the pixels. In a Black and White Adjustment Layer, dragging left will darken the pixels of similar colors and dragging to the right will darken them. If you want to be more selective with your changes, you can make a rough selection containing the area in the image you want to adjust. Along with the major updates to Lightroom CC/6, Adobe also released updates to Photoshop CC 2015. At the link below, Colin Smith at PhotoshopCAFE provides an excellent description and demo for these latest additions. Having Photoshop CC automatically added to your installation of the program as soon as they are released is a huge benefit of subscribing to Photoshop CC. Adobe has released a major update to both Photoshop CC and Lightroom CC/6. The link below is to Laura Shoe’s excellent description of the major features added to Lightroom CC and Lightroom 6. Three of the new features that debuted in Lightroom 6/CC were producing HDR images right in LR without needing to go to HDR Pro in Photoshop, generating panoramas in LR, and also the new Facial Recognition capability. Exploring these new features and many others will be included in the Lightroom class I will be teaching this summer for PVNet at their Promenade location in the Palos Verdes Peninsula Center. Stay tuned for details. In the meantime, check out this great article by Colin Smith that describes these new features. A few days ago, I took my DJI Phantom 2 Vision+ out for what I thought would be a routine flight. I went to one of my regular flight sites, the Field of Dreams in San Pedro, CA. 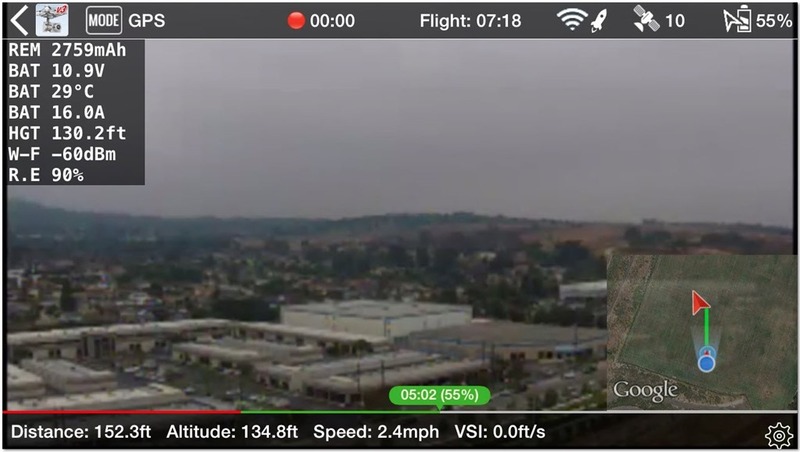 Other than just to fly, my main goal was to use the FPV Booster app with my iPhone 6. I normally fly with the DJI Vision app, but FPV Booster has several features that are attractive to me. One is its Flight Tracker, and another is the ability to capture the screen with a finger swipe. I started out with the battery registering about a 94% charge level. With that level, I expected 15+ minutes of flight time. I had plenty of satellites and began my flight. I call myself a park flyer in that I generally stay within the confines of the area where I am flying. Fortunately that was the case this time as well. Everything went well for the first 7 minutes of the flight or so. Because I am still learning about FPV Booster, I did not go very high – actually I seldom go above 150 feet. That is sufficient to capture the videos and still images I take with my Phantom. Below is a screen capture I took of my iPhone during this flight. By the way, that is the Target store on Gaffey. A little over 7 min into the flight, my battery level was a little above 50%, which was on-track for a fifteen minute flight. I monitor the percentage closely. My Phantom is set to return to its takeoff point or do what’s called an RTH maneuver at 30%, and I want to land before that occurs. All of a sudden, my battery’s charge began to fall rapidly. I did not notice this immediately. The level sunk to below 30% in a matter of a few seconds, and the Phantom initiated the RTH maneuver. What it was trying to do is to return to the place where it had taken off. But, the battery charge was falling so rapidly, the Phantom landed automatically by itself. It was smart enough to know that it would not make it home. This is another great feature of the Phantom. The problem was that the it landed about 150 feet from the takeoff point. No problem. But what if I had been flying off the rocks at PV or over some other area that was not a great landing site or accessible by me to retrieve it? The video below shows the ground track and telemetry data for the last minute or so of the flight from the FPV Booster’s Flight Tracker module. Checking with the online community of quadcopter flyers, I found there were some earlier signs that I had missed that pointed to why the battery lost its charge so rapidly. There are also steps you can take to ensure you get maximum battery life. As I learn more and more about this hobby, I find that there is still so much I don’t know. Let me know in the comments below if you have had similar experiences and what you learned from them.